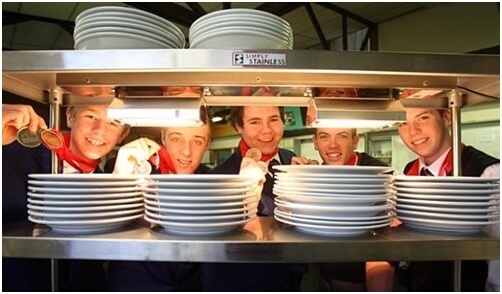 The Year 11 Catering programme is made of Hospitality Standards Institute (HSI) Unit Standards at Level 1 and Level 2. There are seven units available with you being able to gain both unit standard credits and NCEA credits to the value of 21 credits. You will undertake four periods of catering per week split into two theory and two practical lessons. Each unit is broken into three sections with assessments for each including written, practical and completion of a workbook. The Catering and Hospitality sector is a diverse and varied one. From working after school and at weekends as a kitchen hand or in a takeaway establishment to a career as a cook/chef. By learning the skills in catering it will allow you to develop independence by being able to provide for yourself and cook and feed yourself and your family. The skills you learn in Year 11 will allow you to understand the workings of the kitchen and show you how to prepare and cook food that can support you in the future when you leave home to study or work. On the career front it will allow you to see what it takes to work in the catering industry and the skills required to study and train to become a chef. If you choose to follow catering as a career path there are many job opportunity from working in restaurants, cafes and hotels to working in the rest home/health sectors to catering for events and conferences. The world will be your oyster as it will allow you to travel and work your way around the world. During the year you will be given the opportunity to be involved in real catering experiences from catering for functions here at school or for local business. You will also have the opportunity to compete in catering competitions including the ILT Southland Secondary School Catering Competitions and the Southern Light Salon Culinaire. You may also be given the opportunity to be selected for the Southland Boys’ High School Culinary Team which competes in Auckland and internationally. The Year 12 Catering and Hospitality programme is made of Hospitality Standards Institute (HSI) Unit Standards at Level 1 and Level 2. There are nine units available with you being able to gain both unit standard credits and NCEA credits to the value of 21 credits. You will undertake four periods of catering per week split into two theory and two practical lessons. Each unit is broken into three sections with assessments including written, practical and the completion of a workbook. In Year 12 you will build on the skills learnt at Year 11 which will increase your knowledge of the Catering and Hospitality industry. Cooking is the process of preparing food by applying heat, selecting, measuring and combining of ingredients in an ordered procedure for producing safe and edible food. The process encompasses a vast range of methods, tools and combinations of ingredients to alter the flavor or digestibility of food. Factors affecting the final outcome include the variability of ingredients, ambient conditions, tools, and the skill of the individual doing the actual cooking. The diversity of cooking worldwide is a reflection of the myriad nutritional, aesthetic, agricultural, economic, cultural, social and religious considerations that impact upon it. In the third term you will be required to operate the Tryline Café. The café operates from 12.30pm till 2.15pm once a week. You will be split into two groups and over a four week period you will prepare, cook and serve the food for the café or set, serve and clean up during and after the café. 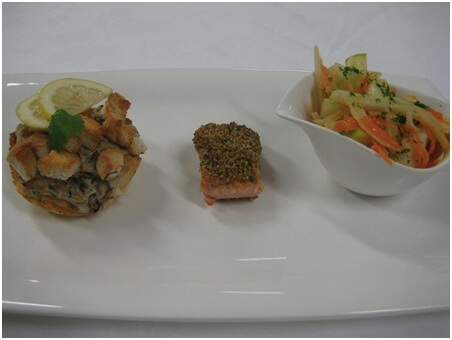 Secondary School Catering Competitions and Southern Light Salon Culinaire.